One of the things I absolutely insisted on in my kitchen was a huge sink. Since I spend roughly 11 to 18% of my day standing over it, considering some women spend a fortunes on tall shoes, and there are men who spend a lot of money on fancy, oversized watches – and vice versa – I thought I was entitled to a big sink. However finding one was a whole ‘nother story. Long gone are the days of “French farmhouse sinks” and any that you are likely to find are either still firmly installed in French farmhouses – and aren’t for sale – or the ones that are for sale are only available in America and England. I didn’t think it would be so hard to find a big, simple, white sink of generous proportions, but it took me two months of searching and walking past sinks with decorative curls and swoops carved into them, which are marvelous places for gunk to collect. And perhaps to hide any bits and crumbs, there were no shortage of sinks in colors like aubergine (eggplant) or citron vert (lime green), or with basins so tiny that they would barely hold a regular-sized dinner plate. I finally tracked down the one company in France that makes the one large sink that is sold here. And, as is often the case, there was a rupture de stock and no one seemed to know when they’d be available again. So I took to the old-fashioned internet, using my new-found (and hard-earned) vocabulary for French kitchen and bathroom fixtures, and tracked one down on Le Bon Coin, a classified ad site in France that just about everyone seemed to know about — but me. (Until now. And now I’m hooked.) I don’t know how I lucked out and found a new one, but we ending up racing up l’autoroute to Lille, which was a good excuse to eat French fries and mussels. And to use our muscles, too, since we found out the sink weighed a dos-disabling 57 kilos, or 125 pounds. One of the problems with the giant sink is that water can splatter everywhere. I’m used to working in restaurants where everything is surrounded by big sheets of stainless steel, so errant water isn’t a problem. And even though there’s stainless steel next to mine, there’s also wood, windows…and me. So I’ve made a patchwork of Oxo silicone drying mats, which may be the best thing I’ve ever imported from the United States. In fact, I just ordered three more for a relative en route to Paris to bring me. When people who are coming to France ask me what to bring French friends, I’m going to say these, as well as dried sour cherries. And aluminum foil. And if you want to save them a little bit of time, and trouble, perhaps a French farmhouse sink. Congratulations on a beautiful sink! Aluminium foil? Surely you must be able to get that in France? It’s sold everywhere in The Netherlands and Belgium, so I can’t imagine it can’t be found in France. The aluminum foil is extremely thin here, and tears very easily. (One could argue that it’s more ecological. But I find I have to use several sheets, plus it usually can’t be reused.) I have a French friends, who cook, that request rolls of heavy-duty foil for that reason. Completely agree about the aluminum foil! It is awful, even here in Belgium. Enjoy your beautiful sink! Living in Belfast I’ve always thought it was some kind of localism to call this kind of sink a ‘Belfast sink’, but wikipedia seems to back this up at least a little. (sorry for the random photo from who knows where XD) Maybe not as good as your US foil, but could come in handy in a pinch? Most of my French friends don’t understand that this is a big issue for me… except for those who have already had a big double sink!!! Le Bon Coin saved around a hundred euros worth of frozen food for us; we managed to replace our freezer for 50 euros in less than 3 hours!! Lidl sells thick aluminium foil, and it comes in a large width and length. It is marketed as “barbecue foil” and is available at the moment. I make a point of stocking up with it when I see it, as the equivalent (which can be found in supermarkets) is much, much more expensive. When I chose the sink I wanted for the kitchen, size was at the top of the list. I wanted to be able to clean an oven tray inside it without having to angle this way and that way, and without having to soak the whole kitchen in the process! Love your sink, but it would drive me nuts that it is installed ABOVE the counter like that. You won’t be able to swipe water off the counter into the sink easily. I had a sink like this installed in my apartment in Amsterdam and was so angry they hadnt installed it UNDER the counter, not over the counter like that. I love the idea of the Oxo mats and will seek them out… My Parisian sink is an awkward size, just barely big enough to fit my dutch oven and not nearly big enough to enable me to actually wash it! I love these ceramic sinks and am considering one but I have a question. Is it true that glasses and china plates etc break more easily in these than in stainless steel sinks? That sink makes mine look like a teacup. I love it! I’ve had to stop using the words aluminum foil because I just can’t make myself add that extra i. It just doesn’t roll off my tongue. I just say tin foil and then nobody corrects me. I CAN get it here and that’s a good thing. A big sink, a decent size refrigerator–those are all on my kitchen wishlist. But my current issue is that I can’t find an apartment here in Brussels that has a gas stove. Everything is electric. What’s more, half of the places I’ve seen don’t even have ovens, and since I bake a lot, that’s an important consideration. My current place has only a tiny stove (a hot plate, pretty much) and no counter space at all. I still cook here, but whenever I do, I feel like a Top Chef contestant doing a quick fire challenge. On the plus side, the weekly market is held in the square right across my place, so I only need to look out of the window to see what’s fresh today. For dried sour cherries (or anything else having to do with cherries), you can order online from Cherry Republic: http://www.cherryrepublic.com. They will ship to Europe. And try a bag of their dark chocolate covered dried cherries while you’re at it. I so love the sink, but it’s a bit of a tease. I’ll keep waiting to see how the rest of your kitchen turned out! Is that a ceramic sink? 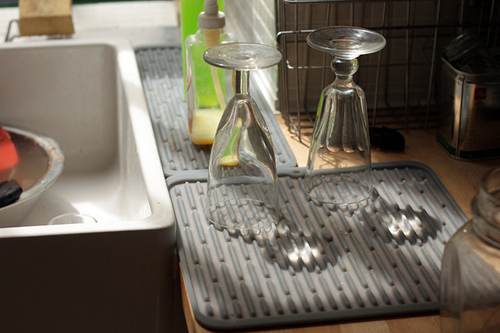 Hint: use a protective mat on bottom of sink to protect it from scratching…Oxo probably makes those as well. Beautiful sink! Thanks so much for your wonderful blog. I’ve been reading it for a year or so now – I will be in Paris in just four weeks from today for the first time! I’m travelling to France with my mom and my daughters (aged 11 and 6). I’d be happy to pack a couple of rolls of heavy duty aluminum foil for you in gratitude for the wonderful reading you’ve given me — I’m Canadian but pretty sure our version is equivalent to what you’re used to in the US !! Aren’t those type of sinks more prone to breaking? I mean how shock-strong are they? At least, it looks good. I was just admiring your vast sink on Instagram. Mine barely fits my Le Creuset. Foil AND saran wrap!! I find both flimsy in Europe. I have often brought people the industrial size saran wrap and press and seal from Costco, but I must say, the French are a bit bewildered by my hostess gift!!! The expats are thrilledthrilledthrilled! The Paris apartment I recently moved into has a large white evier very like yours! It’s old but in excellent condition. Maybe they were more common once? Albal aluminium foil available at my local supermarket is thick and excellent. I do agree the ordinary kind sold here is terrible. subtle, classic awesome sink. But who actually manufacturers it? It’s made by a company called Porcher. Bet the sink was less..? Your sink is gorgeous and also very practical. I also installed a very large double (stainless steel) sink in our renovated farmhouse kitchen some years back. 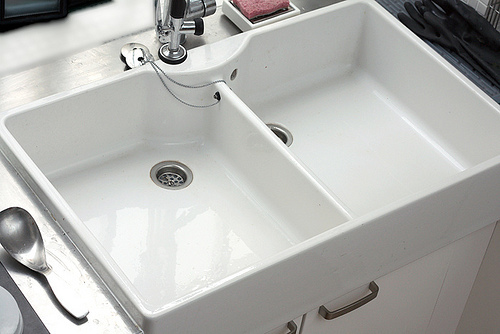 It took some research to find the size I wanted – I was at the point of purchasing a commercial pot sink – and then I found what I was seeking made right here in Canada. It was worth the wait. I can submerge the largest pans, stock pots, and racks, in the deepest side, as well as wash a bushel of beets or carrots from my garden in it. It also becomes a holding zone for dirty dishes when my kitchen is in full swing. It takes someone who cooks and bakes alot (everyday) to appreciate the fundamentals in a kitchen. When I did my culinary training, we were told the most important person in the kitchen was the dish washer! Truth be told. Yes, the most important person in a professional kitchen is indeed, the dishwasher. They are the person you want on your team (or side, since if they’re not, they can really mess you up). 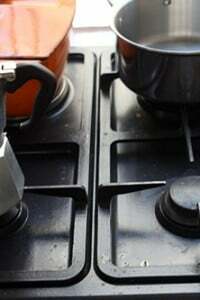 Plus everything has to go through them – all dishes, glasses, pots and pans, etc – hence their importance. pretty sure Ikea has the exact same sink…cause my sister just installed in her farm house kitchen….it’s huge …did you look there? For my new kitchen, since I have a dishwasher the main criterion for my single sink was that it be large enough to hold my largest tray, baking sheet, and roasting pan. I found one in the Ikea catalog for under $100, and though I had to pay for shipping to my rural location, it was still a bargain and the feeling of delight every time I wash a large tray in it is simply priceless. I found an evier almost just like that for my new kitchen at Caitlan’s in Sens, France. They are so cool! Mine has a large sink on the right side and a regular sized sink on the left, with the apron front. Stunning sink, I love your style. I like the size and clean lines of this sink. You are so right that the more decorations you have the more dirt will accumulate, hence – more cleaning! I also agree with one of the commenters that it would be easier to clean the counter with an under mount sink. That’s what I will install in my kitchen when time comes: stainless steel, double, under mount, and with two taps (if I find the right plumber to install it!)! The latter is badly needed since I share the sink and the tap with my husband who is my kitchen helper. There are so many choices in the US, but never was I able to find a double sink with two taps option. Where is that engineer who will make it possible?.. This is MY dream sink too BUT although terribly heavy, it would have to be installend under the working surface – and I know this is terribly difficult because of the huge size and weight…. Went through all the motions too for our kitchen and settled on a double basin in steel because of the am probs. Best foil in France is indeed from Lidl for BBQ…. and I bring mine from Switzerland when I’m there. But then I try not to use any alu foil if I can because of the environment… Still, if you have to; it’s better to use one sheet of a heavy load one than two of a thin, cheap foil. Thanks for showing off – finally – your super duper sink! Un évier de première classe! My former neighbors found a similarly sized sink on Craig’s List for a screaming deal. There’s was stainless steel. The husband and I are still searching for our ideal sink and haven’t yet found one that didn’t have use reeling from the sticker shock. I must remember to check out the OXO silicone mats. Thank you for the tip! Beautiful sink. Congratulations. I agree a bit with the folks who say they’d want it lower so they could sweep the counter right into it, but the trade-off there is you’d probably need a custom height cabinet underneath (and likely desperately miss those few extra inches of height in the cabinet.) You’ll learn how to use the sprayer so water doesn’t go everywhere. – FWIW, Ikea does make a large, white porcelain farmhouse sink similar to what you got, but it’s expensive (too) and I’m not sure about the quality. Porcher makes nice stuff. You picked well. — Now, pictures of the rest of the kitchen, please. Beautiful sink. I’m surprised you had to go to so much trouble to find it though. I have those same mats and they’re great. The square one fits nearly-perfectly inside a tray Ikea sells, if for some reason people want to layer their drainage . . . I like your un-layered patchwork though. Nice sink…hope it’s treated and won’t stain. When do we get a tour (pix or video) of your new place? Getting all this stuff together, and doing this kind of work in Paris is really difficult and it would be discouraging to read remarks like that, which I see on other sites. But mostly it’s more interesting for me to write about various aspects & features, like this, and how they came to be, rather than do the whole tour or “showplace” thing. oops, sorry. I’m not one to criticize your choice but really, really like your writing style and appreciate what you do in the food world and just (humbly) thought it would be nice to see your new place as past posts detailed your tribulations. Again, my apologies in advance for those who choose to interject their own thoughts in a negative fashion. thank you so much for the photos, i guess i’m going to have to print them one by one and assemble a ‘david’s kitchen’ workbook for my next remodel…love the suggestions for gifts. my expat friend in florence loves peanut butter and rations it spoonful by spoonful. The milky film is mineral from the water and will come off with vinegar. If it builds up on the faucet, just soak a rag with vinegar and wrap the area that is gunked up and leave it for a while then brush the mineral off with an old toothbrush. Good as new. If the film on the glasses is from the dishwasher, then you’re screwed..that’s heat etching from the drying cycle and won’t come off. I want your sink except I want it as a single bowl. I figure I can use a dish tub in it if I need a smaller basin. Do you have an aerator on your faucet? It does help with the splashing…at least the splashing from running water. My son ordered a couple of those narrow mats that are used on bar counters in restaurants. I love them! I keep my cutting boards propped up on them next to the wall by the sink. Keeps the edges of my boards dry and keeps them from slipping, too. A few people suggested you can use toothpaste to remove the film, but that didn’t work. But yes, it must be baked in by the dishwasher. One person online – who said he was a glass expert – said that the salt that you add to the dishwasher to counteract the famed calcaire of Paris, is actually scratching the glassware and causing some of that. I wonder why restaurants in Paris keep their glassware so sparkling since it’s run through a machine. Me and my friend Stephanie are flying to Paris from Montreal tonight ! Both of us have read your book and have lots of bonnes adresses noted in our pocketbooks beacuse of it. We have rented an appartment in le Marais and were delighted to see that many of your suggested shops where close by ! Lovely! I put in a similar, deep, two sided Kohler with a lower divider so I can fill both sides together. The most important thing I bought, though, were the stainless inserts with rubber feet. It seemed fou-fou at the time, but it has saved expensive glassware from shattering in the hard sink and saved the sink from chipping from dropped copper pots. They go in the dishwasher so never are slimy like mat liners can be. Enjoy, and keep us up on what you’re making in that great kitchen! I’m loving your renovation posts. I’m in the process of trying to plan my own and as I’m fairly new to Paris I find your tips on the ‘meilleurs endroits’ really useful. It takes ages to work out the best places to go when you’re new to a city, and I wouldn’t have known about the Marché Saint-Pierre if not for you. I can definitely identify with the difficulty of getting stuff like this done in Paris/France in general – thanks for sharing your progress so the rest of us can benefit. It can be a challenge to find things here, especially at reasonable prices. There are no discount stores, especially those giant hardware stores that have rows and rows of sinks in stock to choose from, although there are some in the suburbs (although the prices are close to the same as elsewhere.) It took me so long to find things and I ended up using the internet a lot instead of racing around town, finding out things were out-of-stock. I do recommend the stores along the boulevard Richard Lenoir (11th) – as there are good shops there, like the nice guys at Promo Carreau for tiles. So glad you have shaken off the construction dust – or have you yet :-). I’m upgrading one room at a time, so I’m constantly annoyed with this issue. Gorgeous sink! I didn’t know anything like that was available new and thought I would just have to get a commercial pot sink, which I actually like. But this is beautiful as well. Ahhhhh. Yes, maybe you can get an aerator for the faucet. I only use liquid detergent in my dishwasher and that seems to alleviate the cloudy glass situation, but when I get something crusty (in my well-water community) around the fixtures and sinks, I use EdFred Tub and Tile – aka phosphoric acid. It’s the only thing I know of that is a serious calcium remover. And it will clean up the glasses. I can only imagine your relief at being in your own home again. I have recently come into a few extra rolls of Reynolds Wrap’s finest 200 sq. ft. rolls. Let me know when you run out and I’ll deliver! And congrats on the new kitchen. I know it was quite a trial to get it done. Funny, we live in Burgundy and we have this EXACT sink in our kitchen, which we found at Aubade. I adore this sink, it’s nice and deep, big too. And elegant. As to the splashing, we made the mistake of putting a gooseneck faucet on ours, can’t see your faucet, so water tends to splash behind the sink. but I think the traditional long, low one would have solved the problem. We also put in a disposal, but the drain holes are too small really for that. I will know better next time! I almost gasped at the sight of your new sink – that’s my dream sink when we redo our kitchen. Someday. Whenever that might be. My new house (well it was built in 1979) will have an oversized single quartz sink with a stainless steel bottom grid on the bottom. Whatever is that for? Letting dishes dry in the sink? I cannot wrap my brain around that for some reason! LOL! P.S. Here’s to showing us nosy types your kitchen without fear of the fault finding! I can’t see the comments after 7 am today in the Starbucks post. Did you get too many? Thanks. I tried to submit a comment there. There were quite a bit of comments – but they are working (I just did a test one that went through) – after a certain number of comments, it goes to various ‘pages’ so you may need to refresh your browser. But comments are open on that post.. I just had a kitchen remodel and bought a beautiful sink , somewhat like yours. I bought OXO mats that have holes in them for the bottom of the sinks. I put them in the sink before I start loading it with dishes and put them away after dishes are done. They are great protection for the beautiful finish. Terrific sink! We have a large single basin evier, which I will love even more once we get a faucet with a pull-out head and an aerator; I’m saving up for a good one. I haven’t noticed any more breakage with this sink, although we probably have slightly more wineglass casualties in the French kitchen, given the stone and tile, not to mention the thick Mapa gloves The Dishwasher uses. I am relishing the kitchen glimpes doled out bit by bit. Kind of like eating dark chocolate pomagranate bits one at a time instead of by the handful. Anticipation heightens the enjoyment. I think our water here (well water in Chicago, NOT treated municipal water) also has a high calcium content. (Definitely a high iron content) If it’s not calcium, it’s still very alkaline. When I bought Riedel stemware, I was handwashing and drying to prevent the etching, when my Dad, the appliance repairman, asked me what the heck I was doing. He said use 1/2 the amount of DW detergent and use vinegar as in the rinse aid cup. It’s been since Thanksgiving 2010, and there is no etching on my stemware. They are perfect to this day. David — I love your sink and I hope you continue to love it. I know how you feel not wanting to show the whole thing — as much as I’d love to see it. I re-did my kitchen in 2008 and posted pictures to which I received some great comments and some not so great. Not sure what nay-sayers think you can or will do about something AFTER it’s already been changed! Bottom line is I love my choices, even the ones that give me grief. I did my best. And it still beats the heck outta the old kitchen, so there!! ps — my two favorite things in my new kitchen are… my sink (ha, i swear) and my floor!! I second the comment above about Ikea having good farmhouse sinks. It is called “Domsjo.” It comes in a single and a double sink. I got the single version for my Manhattan tiny kitchen and it has made such a difference! David, I also recommend purchasing a silicone silk mat for the bottom of the sink to keep it from getting scratched when you wash pots and pans. I read that powdered dishwasher detergent “etches” glass. I use gel only. Thanks for the post and thanks for sharing your sink with us all! Still remember the post about how difficult it was to find it… I loved Lille when I visited :) Hope that you found it as nice too. Enjoy your kitchen and sink ..
For cleaning glass from calcium film use hot water with dissolved mustard powder. Thanks for your wonderful notes. Victor: Never heard of that one! I know there’s a product in the US called CLR (or something like that…) which is supposed to clean calcium stains. But it seems that they get etched in, and once they do, there’s not much you can do about ’em. Martha: In France, we have the “powerball” – which at one point, a reader (who said he knew a lot about glass) said that whatever was in the red ball in the middle was likely scratching the glasses. So I stopped using them, although am not sure if that’s true or not. Minette: It’s amazing all the things you have to pull together, and all the details and decisions you need to make – under a lot of stress. Mistakes get made, wrong decisions happen, materials that are supposed to be one thing turn out to be another, etc.. and most of that stuff you just have to accept. I am sure each time you do it, it gets easier. But I’m not so anxious to test out that theory! As few years ago I was having problems with my dishwasher leaving a film on my glasses so went to the appliance store where I purchased it and asked them what to do. They told me 1) I was using too much dishwashing powder and said to measure 2 tablespoons only into each little trap door that opens during the wash cycle(I was filling the trap doors full of powder previously). Also they said that Cascade dishwashing powder is full of additives now and to use the cheap generic dishwashing powder instead. 2) They said to use a product called Lemon Shine in the final wash cycle of the dishwasher. And to replace one of the tablespoons of dishwashing powder with 1 tablespoon of Lemon Shine. So I put 2 T dishwashing powder in the trap door that opens first and 1 T dishwashing powder and 1 T Lemon Shine powder in the trap door that opens last in the cycle. That solved all my problems of “milky” glasses etc. Congratulations in the new sink! I am leaving my apt in 2 weeks, and will gladly say good riddance to my sink, which is the size of my dinner plates. Love the sink, I have one that is similar – bought it at Ikea – they have both the single and double and it is well priced no problem with brakage. I have had it for 4 years and still looks like new. I look forward to seeing whatever parts of your kitchen you choose to show off. There is a home reno blog I read (brownstoner), and it is, as you say, full of critics, so I know the people that post their renos must have thick skin. For me, I could never post any of my kitchen as it is entirely unrenovated and without charm. By the way, I made your Israeli bread, with sour cherries, and it was awesome. Thanks! David: love the off-set drains. So hard to find for ONE side, much less TWO. Brava! Always love following your restaurant recommendations, but please take off MA BOURGOGNE at Place des Vosges from your list. The attitude of the waiters is just ridiculous and this place does not deserve to get guests thru your blog…. I’ve eaten there a number of times and I haven’t found them to be discourteous or have attitude. The food okay, but classic French, and it’s one of the few places that’s open every day and no reservations are taken, so one can often get in. Plus it’s nice to sit under the arches of the Place des Vosges. I was wondering, David, do the French use metal pipes still or is your new sink installed with PVC (white or grey plastic) pipes? Also are shipping costs so prohibitive that you could not have a friend purchase and ship an American sink to you? I was curious about how much of a hassle it is to ship to France/Europe now. Like customs, taxes and fees, etc. Great blog btw. I can only dream about what you are living everyday–as I suspect a certain proportion of your readers do too. Keep living our dream for us, David, the good times, the bad times, the hassles, the mundane and boring times — it’s all good to us and worthy of telling. Sometimes, I swear, I can smell the food (esp. the baguettes) right through the ether from far, far away in France. Many thanks! Those OXO mats look like a really smart idea. Gorgeous sink! I have those drying mats as well and love them. But I absolutely adore your glassware pictured here. Are those old soda fountain glasses? I absolutely love big sinks!! Unfortunately my kitchen is tiny so I cant have one, but I will one day! Just wanted to say I have just devoured about 10 Caramels from your Salted Butter Caramel recipe. Oh my they were literally a god send! I have blogged about it here http://sweetcraving.wordpress.com/. I love your recipes and am looking forward to trying some more! Ahhhhh….pretty, pretty sink! My husband and I built a house almost 20 years ago (can it really be that long ago? ), anyway, we had absolutely no experience in that area, but we forged ahead and yes, made a few mistakes (light switch behind the door, -but to be fair, the doors hadn’t been hung yet), however, what I’m most amazed about is how many things we managed to get right. My home is my haven and I can’t imagine living anywhere else now. And a lovely sink it is! I am sink shopping for our little ranchette in the valley and I haven’t had much luck here in CA either! Perhaps I should import one like yours? LOL!! deep sinks are heaven. i grew up with one and didnt realize until i moved out, to a crummy apartment with a shallow sink. it’s awful! Sadly, what Lee says is true… no Michigan tart cherries this year (and likely no apples, peaches, etc. either). As a Michigander who owns a small jam/ preserves business with a focus on local fruit, needless to say we are freaking out a bit. The first time I went to France, in high school, we brought local gifts for the family we stayed with, including MI cherry jam… only to discover a large sour cherry tree right in the backyard, in full fruit! I take it they just don’t eat them dried? They are missing out. FWIW, despite any potential drawbacks of a ceramic sink, that white is just so much more visually appealing than stainless. Hope you enjoy it! Thank you for the Oxo drying mat tip. I’ve been stressed out trying to protect the wood counters bordering my new sink — this is the perfect solution!!! The link for the ice cream machine leads to a blank page. David, Great sink! So thrilled for you and your new home! Just FYI, An appliance repairman once told me that the etching is caused by too much DW detergent (it’s highly corrosive). He recommended always using very little detergent on the shortest setting possible for everything. The reason restaurant glassware doesn’t get etched is because the wash cycle is very short. Good luck! Congratulations on finding your perfect sink – it looks fabulous! And thanks for sharing the story. As an Australian living in Japan I can relate to the troubles of finding things that you want / love and know are readily available at home. Good luck as the renovations continue! David, MAJOR CONGRATULATIONS on the sink! it’s gorgeous and (as someone who cooks a lot), a lot like what i dream to have someday soon. 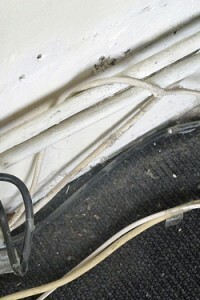 thanks for the update – having read your post The Search it’s great to see The Find! re: glass etching, i echo the advice of others here – a) powder detergent and too much detergent will do that. even for things like all clad, let alone glass. so the advice i was always given is use less detergent and find a gentle, liquid kind. b) white vinegar is a miracle worker, when it comes to removing calcification/grease/soap scum/years of dust built into floors etc. i’ve also used bar keeper’s friend (muriatic acid) and it works beautifully. they now have a liquid formulation. maybe someone can bring you a bottle from stateside? i’ve heard bon-ami is similarly effective, but i’ve never tried. a) i take large baking sheets and put one on the left of the sink, one on the right, so that each sheet is resting half on the counter, and overhanging half over the sink. that way, if i’m washing something like a sieve or colander, i can slide it under the overhang and the water doesn’t go everywhere. cramps the sink space some, but i prefer it to getting soaked. b) there are these great in-sink colanders. i like the one from oneida. they look like oval stainless mesh baskets, and have adjustable extending handles with silicone grips that sit nicely onto the sink. i’ve found washing fruits, veggies in that majorly prevents splashing, and also saves a lot of water. plus you get to wash with both hands so it saves time. i’m a fan! thanks again for sharing. hope the kitchen (and the sink) bring you many years of sweet joy, making The Search just a distant memory. God yes! Foil! It must be a European thing. Greek aluminum foil is flimsy as well. And it’s not just a local brand. I found some that was labeled “professional” and all it was was wider, which meant it could line a wider tray, but it still tore as I was trying to line my brownie pan in the time-honored “turn pan upside down” fashion. Thank you for making me feel less alone when packing heavy duty Reynolds wrap (and zip-lock freezer bags) in my bags. It’s a beautiful sink! Perfectly made for what it’s meant to do! Hello! 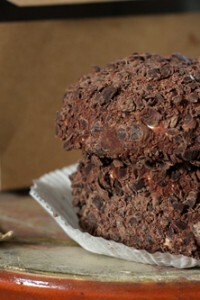 I’ve been a longtime fan of your site and recipes, and am planning a trip to Paris in a few months. I was wondering if you have any favorite prix fixe restaurants at a good value? I’ve been doing some searching on the internet, but I figured if anyone would know, it’d be you! There’s a list of favorite places in Paris the My Paris page, which I regularly update. There’s also an archive of Paris restaurant write-ups on the site. You might want to check out Les Papilles and La Régalade for restaurants with reasonable fixed-prices menus..and good food! We had our bathrooms done last year and I’m in love with our new, big bath. I wanted it big enough to fit 4 small kids – which it does – or just me lying down with legs fully stretched out. Bliss! David, I am smiling at your rationale for not posting the entire kitchen tour. I have never understood the mindset of those who know what their friend has purchased, has installed, whatever, and then says that they have a (brand, model, whatever) that is better, that they know that your brand has problems (which they enumerate in mind-numbing detail), hope that yours doesn’t do (this, that, the other, all negative), and on and on and on. It is discouraging – and in my book it is rude. I am thrilled to find myself on a thread where aluminum foil is OK. The envirowackos have decided that it is not (do they never buy things in cans?) and consider themselves to be almost religiously superior for not using it. Feh. I not only use foil, but I use Release foil which may be one of the most brilliant innovations ever. If I were coming to France any time soon I’d bring you foil. And dried cherries. I have also found sturdy square terry bar mops that make brilliant drying “mats” for glassware or anything else you must wash by hand. White, clean, bleachable, absorbent. Perfect. Your practicality is as interesting as your knowledge of food … a great combination, I’d say. Thank you for sharing with us. I too love your blog and have used several of your reccos with great results, however, ma Bourgogne should not be on the list. Food was ok, but the staff is not welcoming of foreigners, this is confirmed by reading reviews at other sites. One of the waiters (balding, older gent) was downright insulting, mocking my French in a sarcastic manner while he proceded to treat me and my wife as though we were somethung he scaped off his pompous shoes. Why give these people business? I had to stop and stare at your sink when I came onto the page! I live in Japan and while all the appliances, furniture, portion sizes, etc. are generally smaller than in the west, I absolutely LOVE my kitchen sink! It’s huge. Just measured it and it’s 75 x 50 (60 near the drain) x 20 cm with an aerated faucet attached to a hose. The two things I want to take when I leave Japan are the sink and the high-tech toilet seat. The foil, however, sounds like it’s the same as in France. I agree totally with your Lemon Shine recommendation. Our municipal water is so hard and I have no water softener. The only thing that works is the Cascade packs with Lemon Shine. @ Christine My ceramic sink ist 101 years old, since I’ve had it nothing has ever broken! I agree on Ma Bourgogne, I’ve been a few times since I live nearby and the waiters can be rude and the food is pretty average and expensive. Certainly there are better places to eat! I just installed a Rohls, Shaws original sink. You know the one that is made in England. It is huge and deep, I love it. Gave up the dishwasher for the sink.I figured you would go for that sink since you are already in Europe. Anyway I had the same splatter, splashing problem. I eventually learned to put my hands down into the sink not up higher where the faucet is. No more splashing. I know you will love your place when you are done. I love my kitchen, dark wooden floors, white to the ceiling cabinets and carrara marble counters and the white sink of course. Enjoy! DAVID, i live in Hungary and there is an endless supply of dried sour cherries available here. let me know if you want me to send you some. I wonder if VitroClean, the product they sell for cleaning glass cooktops, would help with cleaning stained and etched glasses. I’ll have to go try it. Leroy-Merlin also sells a sink similar to your new one and similar to the 1960s-vintage sink in my kitchen here in Saint-Aignan. In Canada, I bought a Villroy & Bosh double porcelain sink just a couple of years ago. It’s made by Villroy & Bosh, the French manufacturer! I love it and cannot think how I lived without it. Would it be better to find a big and ‘deep’sink? I can see that the sink is shallow.perhaps a deeper one would minimize water splatter…..
Well Villeroy & Boch is technically a German company….although it was founded in 1748 in France and later moved to Luxembourg, the company headquarters have been in Mettlach, Germany since the 1800’s. Then again that entire region has changed hands between the French and Germans several times, but please don’t mention the war. My husband grew up in the area and my in-laws still live there, near the most amazing V&B outlet. Our everyday dishes are V&B French Garden and we got married on the Villeroy & Boch estate called Linslerhof in Überherrn which is now a hotel/event venue run by the current generation of V&B children. V&B besides making great dishes also has great kitchen sinks, here is the French website: http://www.villeroy-boch.com/fr/fr/home/cuisine.html With some gorgeous pictures of big sinks…heart.If you are ever in the Mettlach area the V&B Museum and outlet shops are well worth the visit. Plus the area is great wine country and has gorgeous scenery, have a look at the Saarschleife area (http://www.tourist-info.mettlach.de/english/index_e.html) and take a boat ride on the Saar, then go to Mettlach to the V&B outlet and buy your sink. But first have a piece of cake and a coffee in the little cafe in the V&B museum (http://www.villeroy-boch.com/de/de/home/unternehmen/villeroy-boch-erleben/erlebniszentrum/museumscafe.html). Can you tell I am a big fan? Thank you for the lead on the OXO mats…you have solved a problem that has really irked me since our kitchen re- do a few years ago. The rectangular one fits perfectly behind the sink in front of the window. Rinsed glasses, kitchen gadgets etc are quickly placed there to dry and no longer do I use valuable counter space for this task. I love how air can circulate with these as well, unlike using a towel etc as a drip collector when air drying on a counter top. And while I am saying thanks- thanks for all you do, all you write, all you teach and so on. You are an important part of my daily life, your email alerts of a new blog post always cause a smile to appear – without me even thinking to smile. Just an automatic reaction to knowing I have another chapter waiting for me to read and something new to learn about, drool over, ponder or dream about. Thanks! I personally love a hugs single sink. the bigger the better. I can fit whatever needs cleaning into it. (including kids and dogs). and cleanup is a breeze. I don’t have an aesthetically pleasing sink, but it is huge and does the trick. I love the sink! We found a similar one in Ikea and had it installed in our kitchen. It was a good decision – it’s just so useful and practical. I would recommend it to everyone.